Qualcomm's Snapdragon 845 chipset powers pretty much every flagship Android device that isn't made by Huawei or Samsung this year, but it is pretty old at this point, launching on the Galaxy S9 this spring. Its successor, tentatively called Snapdragon 855, may have just been benchmarked inside a development board. 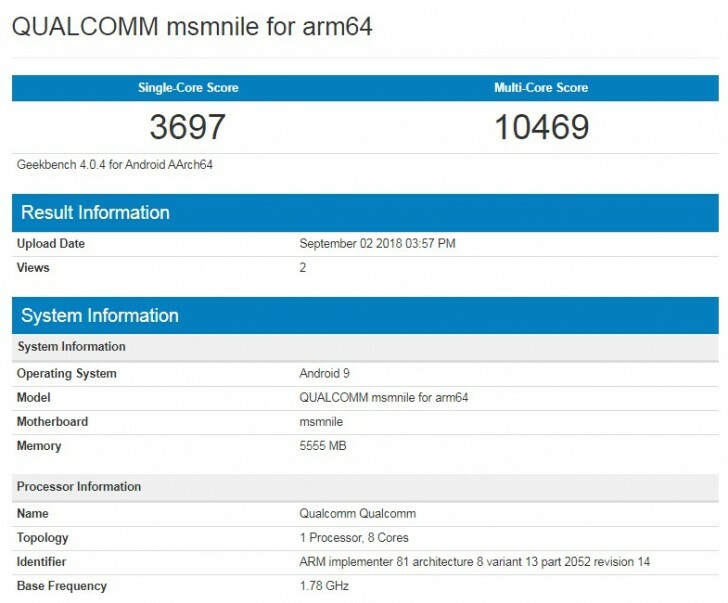 The Geekbench listing doesn't give us the chipset's name, only its codename - "msmnile". It was paired with 6GB of RAM on the test device, which ran Android 9 Pie. Its multi-core result of 10,469 matches what Apple's A11 Bionic SoC usually manages to accomplish. That's what powers last year's iPhones. On the single-core score side Qualcomm's next chip still can't match Apple's, but it is getting closer - 3,697 compared to around 4,300 for the A11. That said, Apple won't be sitting still, and it's pretty much a given that the A12 SoC it will introduce in the upcoming iPhones (due to be revealed on September 12) will perform even better than the A11. So, even if this is the Snapdragon 855, by the time it hits the market in actual shipping devices next year, it's reasonable to expect that it will still be behind Apple's latest and greatest when judging by this metric alone. There's also the possibility that "msmnile" isn't a chip intended for smartphones at all, instead showing up on Windows devices. Qualcomm and Microsoft have already been working on Windows on ARM for a while, and this might be the next SoC for that endeavor, it's impossible to tell at the moment for sure. For what it's worth, the test device with "msmnile" at the helm has also been spotted at HTML5test, where its Chrome Dev browser scored 510 out of 555 points. Great. Qualcomm almost matches Apple's A11 Bionic, which is a 2017 SOC. Well done, Qualcomm. Narrowed down the edge between iOS and Android from 3 to 2 years. Maybe by 2030 Qualcomm will have SOCs that match Apple's. You are further showcasing your lack of basic knowledge. Android doesn't need to switch kernels in order to run on Apple A11, as Linux kernel is already compatible with ARMv8.